PREPARE for the onslaught of plug-in hybrids. 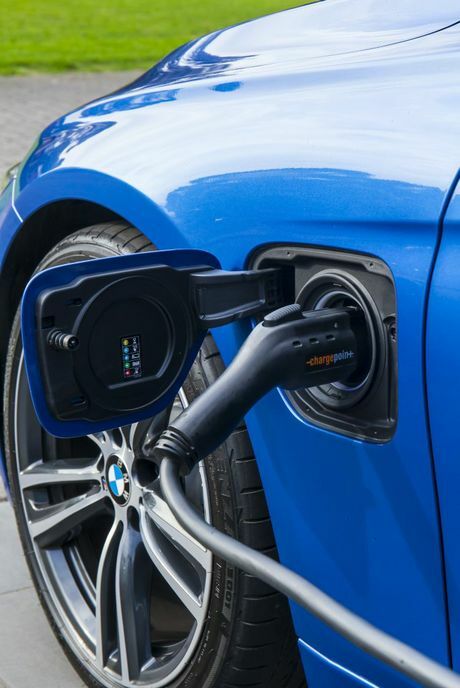 BMW has just launched two, the mid-size 330e and the large X5 xdrive40e, which strengthen the resolve behind its pin-up electric offerings in the i3 and i8. These aren't just flash versions of hybrids, such as the Toyota Prius, we've seen before. Consider this the short-term solution to alternative fuels. Audi launched its own derivative, the A3 e-tron, last year and there is a Q7 large SUV e-tron on the way. Mercedes-Benz expects to launch 10 plug-in hybrids by next year. Following the success of Tesla, the popularity of all-electric vehicles will ramp-up post 2020. But for now the plug-in hybrid enables buyers to dip their toe into greener waters. Well, greener to an extent. It all depends on where you source your electricity but offerings such as the 330e are certainly thought provoking. 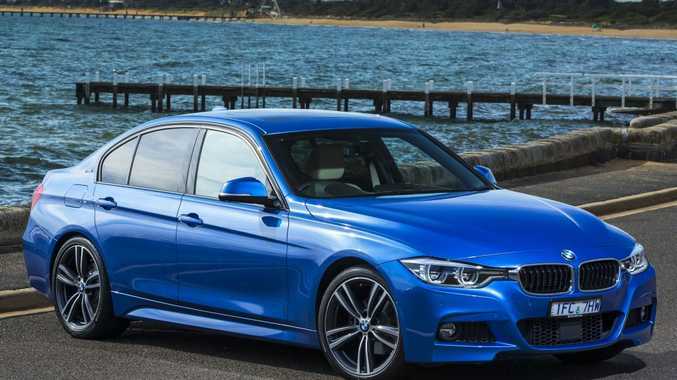 With a retail price of $71,900 - a $2000 premium over the conventional BMW 330i - it's a high-end pitch at those with luxurious tastes and an environmental skew. 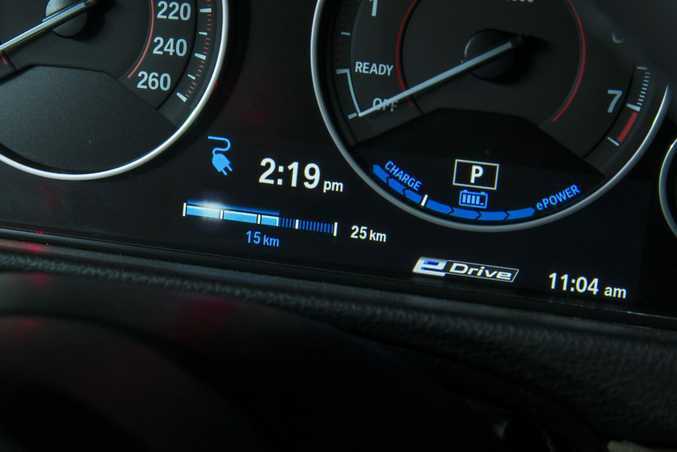 Apart from the special "eDrive" button near the shifter, you have little indication of the electric wizardry beneath its skin. 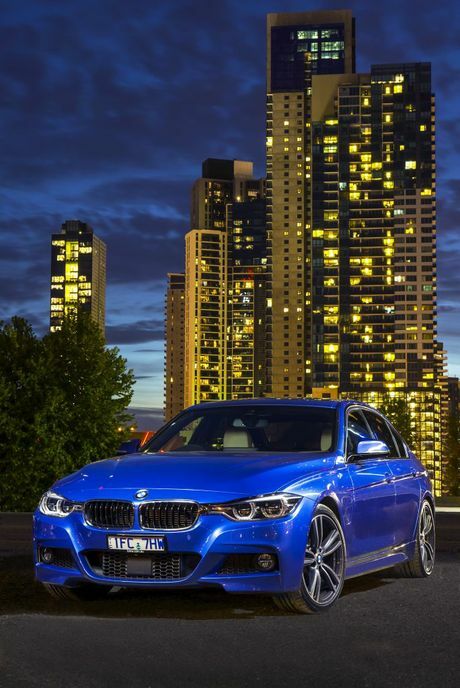 Part of the appeal is that the 330e looks and feels like your everyday offering. 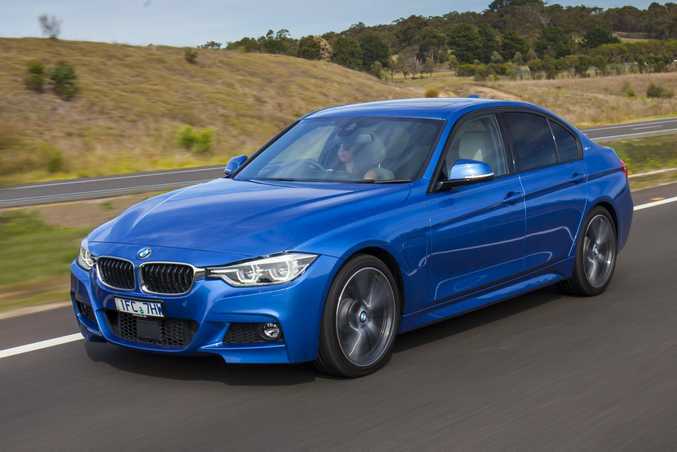 Refreshed this year, the 3 Series remains a sensible and confident sedan. Operationally it makes the complex easy, and users can navigate their way from the central dial-operated iDrive computer system to the dash-mounted controls with ease. Nicely bolstered seats offer levels of refinement expected of a premium brand, and while you could fit three adults across the rear bench two are a better fit. Press the start button and there is silence. With ample charge in the battery only the dash comes alive before shifting into gear. Yet stamp on the accelerator and there's no doubting its prowess. An electric motor delivers instant- aneous power. Generating 65 kilowatts and a hefty 250 Newton metres of twist, a quick prod proves there is no performance deficit. 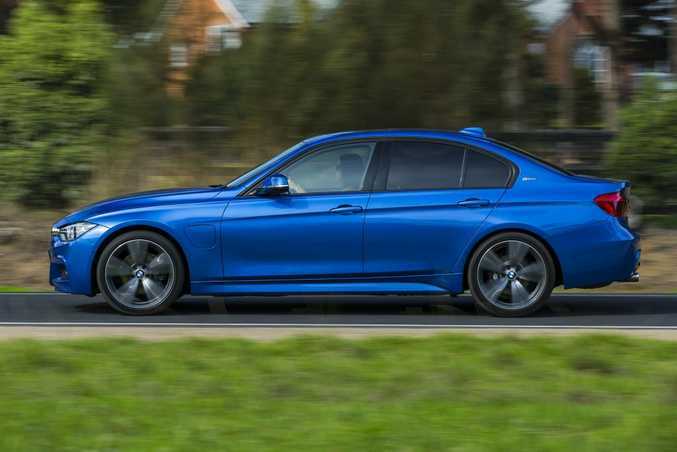 It's only slightly slower in a sprint than the 330i, 6.1 seconds versus 5.8, but the 330e has 70 more Newton metres of torque while both have equal total power output. Shifting between electric and petrol power is done seamlessly and, as long as you have enough battery power, you can operate purely on electric power at speeds up to 120kmh. Ask too much of the electric motor uphill or via acceleration and it quickly shunts across to the petrol donk, although for the majority of driving you can remain reliant on the battery. 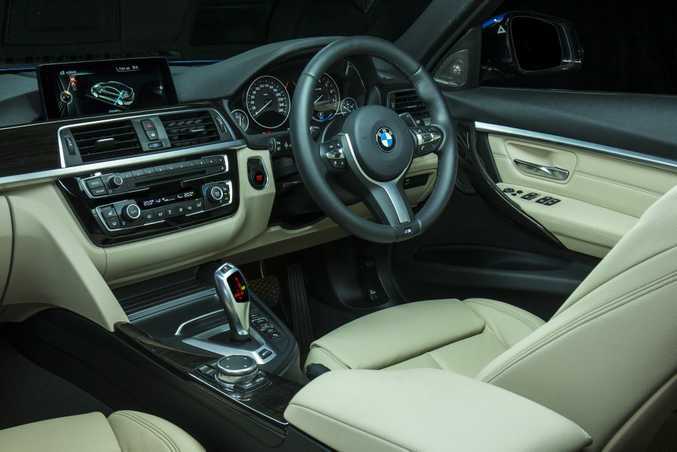 While not quite as sporting as its stablemates - you get a standard automatic rather than the sports unit and adaptive suspension found in all but the entry-level 3 Series - the 330e is no slouch. Tackling bends with enthusiasm, it possesses the typically fun attributes expected of this sedan. Drivers can choose between the standard modes, including two sport, comfort and economy options. Weight balance of 48:52 front-to-rear makes it a joy to pilot with a direct and confident feel through the steering. Gaining 165kg over purely petrol-powered offerings, you don't notice the extra pudginess. Equipment includes dual-zone climate control, keyless entry, heated electric seats, Dakota leather upholstery, 19-inch alloys, sat nav with real time traffic updates, radar cruise control, head-up display, along with ConnectedDrive which provides information such as news, weather and Google local searches. Top-notch safety equipment is incorporated, with six airbags, radar cruise control, lane keeping and change assist. It also generates an artificial sound when driving electrically up to 30km as a pedestrian safety measure. The key prestige rivals comes via the plug-in Audi A3 e-tron ($62,490), conventional hybrid via the Lexus CT 200h ($54,990), Infiniti Q50 Hybrid ($67,900) and even BMW's own i3 ($63,900). Plus there is also the full electric Tesla Model S ($128,882 drive away). Official numbers from BMW have the 330e at a paltry 2.1 litres/100km, but our travels couldn't achieve better than seven. While the daily trip to work was less than 30km, which it should achieve with ease, quick trips during the day and the lack of fast charge stations made things difficult. Your standard eight-amp household point will recharge a flat battery in about three hours and 15 minutes - official BMW 16 amp options can be installed for about $1750. Depending on your home deal, it will costs about $1.70 per recharge. Fast charge stations take about 15 minutes. Without solar or alternative energy, it's probably still not enough of a gain for many buyers. Maintenance should be no more than your standard 3 Series, and BMW has servicing plans available. Losing space due to the battery being located beneath the boot, total volume is 370 litres. It is bolstered by the ability to drop the back seats in a 40-20-40 configuration. There is also no spare, and run-flat tyres which can be expensive to replace. A 5m cord for temporary recharging fits snugly in the boot. The cabin maintains typical creature comforts, with a pair of cup holders in the front and another in the rear fold-down arm rest, while there are also bottle holders in each door. Access to USB, auxiliary and 12-volt ports are also available in the console. Apart from the "e" badging, it looks like a typically refined 3 Series. No crazy aerodynamic lines or wings, it's green technology without a shouting colour scheme. According to government sources, Australia's average commuting distance is 15.6km. Those on the Sunshine Coast, Tweed Heads, Mackay are between 15-20km, while rural areas are closer to 31km. So if you charged at home and work, most drivers could get by with limited petrol use each week. The stumbling block remains the time and range. 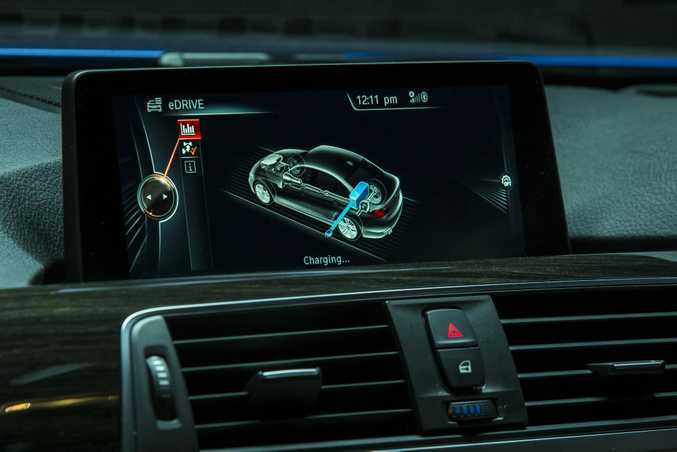 It's certainly more convenient to charge just once a day, and we loved the $63,900 BMW i3 which had a range of about 130km - you just have to embrace the quirky looks. 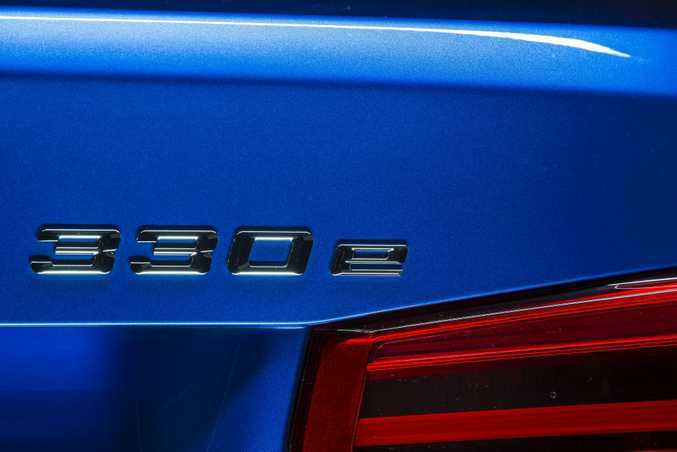 For those with a short, stop-start commute the 330e would work, but the motivating factor would have to be welcoming new technology rather than pure operational savings. Details: Four-door rear-wheel drive premium plug-in electric hybrid. Engine: 2.0-litre four-cylinder turbocharged petrol with maximum power of 135kW and peak toque of 290Nm paired with 65kW 250Nm synchronous electric motor. Bottom line plus on-roads: $71,900. What we liked: Punchy performance, lose none of the 3 Series driving hallmarks, doesn't look any different from normal range. What we'd like to see: More fast charging stations and clean energy options, improved range, some funkier interior finishes like in the i3. Warranty and servicing: Three-year/100,000km warranty with condition based servicing. Lithium-ion battery warranty six years/100,000km. BMW Service Inclusive available for $1350 for five years/80,000km.